Many human characteristics are normally distributed. The diffusion of most innovations has been empirically shown to approach normality, with the distribution of adopters over time following a Gaussian curve. As there is no simple mathematical expression for a normal curve, other models have been developed that also provide good fits with observation. In this section, we present the five most commonly used diffusion models. All these models assume that the diffusion rate of the innovation is proportional to the remaining number of adopters to reach saturation. The models predominantly differ in the assumptions they make about the coefficient of diffusion. We start with the most widely used model, the logistic curve. The logistic model assumes that the rate of change in demand is proportional to the current level of demand. Intuitively, the assumption is that diffusion occurs through “contacts” between members of a population rather than through external influences like mass media and advertising, and the pressure to conform plays an important factor in the decision to acquire a product. For this reason, the logistic model is also called the “internal influence” model. The logistic model is one of the most employed models due to empirical evidence and its relative simplicity. It is often met in nature, biology, physics, medical science, and this is what makes the logistic curve more used than any other forms of S-curve. For instance, the weight of a growing pumpkin is very well approximated by a logistic curve. The exponential model applies to products that are already well known to end-users, for instance because extensive advertising has already taken place. The exponential model is also called the “external influence” model as it is based on the assumption that there is little or no influence between the members of the target population, and all influences come from outside via mass media or an authoritative decision, for instance from a company’s management. The model is also appropriate in the early phase of a new product introduction to depict the adoption of innovators and early adopters, who do not acquire a product because it is already widely spread in their environment (which is never the case initially). In this case no imitation is taking place between members in the system. Whereas the logistic model has its background in the natural sciences, the Bass model has been developed by marketing scholars to predict the rate of adoption of consumer durables like washing machines and TV sets. It has later proved valuable for a large range of other goods and services. The model is not only consistent with the innovation diffusion theory developed in the academia but its validity has also been largely confirmed by empirical evidences. The model assumes that the early adopters buy a product predominantly under the influence of mass-media coverage as interpersonal effects are missing early on, whereas interpersonal channels creates persuasion effects on later adopters as knowledge of the product is already available among other users. The Gompertz model was originally used in biology to model that the death rate in a population increases exponentially as the age of individuals in the population grows. In the diffusion of innovation, the model is most appropriate when a new technology offers no substantial advantage over an old one in terms of price and features, so that purchases of the new technology are driven primarily by equipment deterioration rather than technological innovation. It can also be used to model innovations that diffuse at varying speed across different groups of adopters. In practice, the Gompertz model generates forecasts that are fairly close to those obtained from the extended logistic model discussed in the following section. The modified logistic curve is particularly appropriate under the assumption that the target customer base is not homogeneous and a very fast adoption by the more well-off part of the population takes place at the beginning, followed by a slower adoption by the rest of the population. The modified logistic curve is also thought to be more appropriate when the existing level of adoption does not necessarily make the additional take-up easier to achieve, as is the case with innovators, or when interpersonal contacts might be less pronounced. It can also be a better model when a replacement process is taking place without the new product necessarily bringing a breakthrough innovation compared to the previous generation. 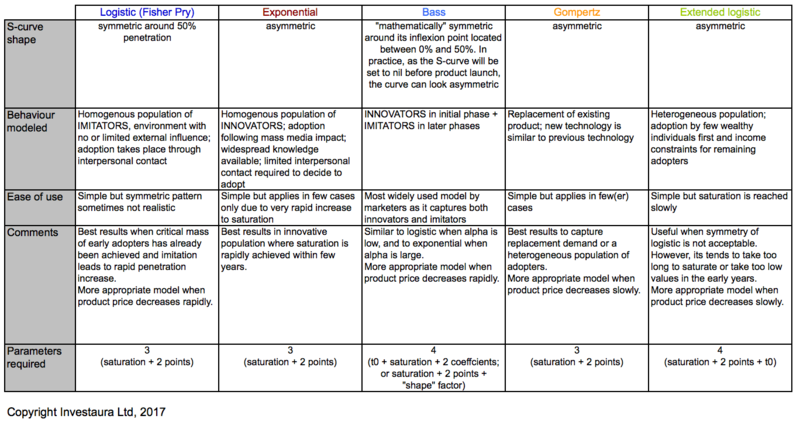 The main characteristics of the five S-curve models discussed above are summarised in the table below. The logistic model as well as the Bass model, which can be regarded as a generalisation of the logistic model, give the best results for the majority of innovation and have therefore been highlighted in the table. Download the five models in Excel for free. When “keeping up with the Joneses” and imitation effects appear to be particularly important in the market dynamics, then the logistic model or its generalization the Bass model is probably the best one. When imitation effects are a lot less significant because price remains a barrier, or replacement without technological advantage dominates, then the modified logistic curve probably gives the best results.